I started reading up on plant micronutrients when I noticed that our strawberries weren't as tasty this year as last year. Sure, the heavy rains a few weeks ago probably contributed to the lack of sweetness, but strawberries that I'd transplanted to new beds last fall were tastier than strawberries that had been in the same beds for over two years. 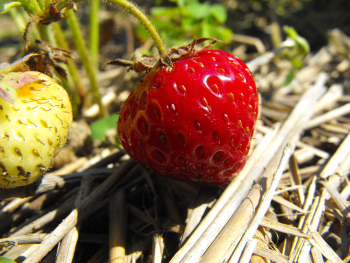 Could the old strawberries have used up micronutrients in their soil, resulting in less tasty fruits? As I read up on micronutrients, an astonishing story emerged. The conventionally grown crops you buy in the grocery store are churned out in massive quantities through farming practices which feed the soil with chemical fertilizers. These fertilizers provide the plants with the big three nutrients --- nitrogen, phosphorus, and potassium --- which is a lot like feeding a human solely on artificial protein, starch, and fats. Over a few years, the crop plants use up all of the micronutrients in the soil and start producing food which is also deficient in those micronutrients. An unreferenced post on Wikipedia suggests that dealing with these micronutrient deficiencies could make us 10% smarter. And maybe make our strawberries tastier? It would prove we were at least 10 percent smarter if we refused to buy chemically farmed food. That's fascinating! Have they run a blind taste test on her? Intriguing!